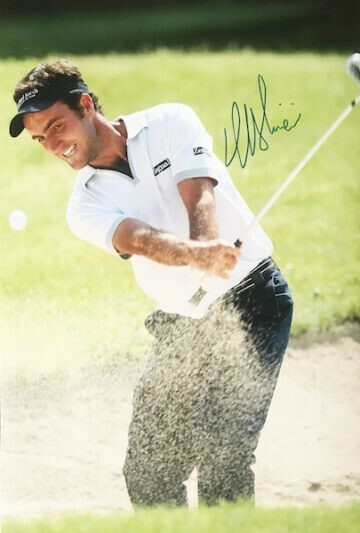 Shop our signed Francesco Molinari golf memorabilia including autographed items from the great Italian champion! Signed Francesco Molinari golf balls, clubs, shirts & caps. All with free UK delivery, Certificate of Authenticity and fast worldwide shipping – many with signing proof! Young Italian golf sensation Francesco Molinari has quickly risen to prominence in recent years – with promising talent and exciting natural skill. Molinari was born in Turin, starting off on the amateur circuit before turning professional in 2004. Throughout his professional career he has stayed just under the radar, winning various high-profile competitions and finishing just shy of first in many others. Despite this he’s remained within the top 100 of the Golf World Rankings consistently since 2008. In 2010 he won the WGC-HSBC Champions in Shanghai, going on to become the only Italian to win a national open twice in 2016. He has also represented Europe in no less than three winning Ryder Cup teams – in 2010, 2012 and most recently in 2018. In 2018 he enjoyed a spectacular breakthrough – winning the prestigious Open Championship ahead of the likes of Rory McIlroy and Justin Rose. It was the first major ever to be won by an Italian professional – raising the profile of other Italian golfers and inspiring a new generation of sports stars. Older brother Edoardo is also a professional golfer – together they won the 2009 Omega Mission Hills World Cup, another first for Italy. Despite his very recent triumph and rise to fame Molinari has already spoken of his plans for early retirement. Labelled ‘mundane’ in jest by fellow professional golfer Wesley Bryan, his plans include ‘hanging out in cafes and reading books. 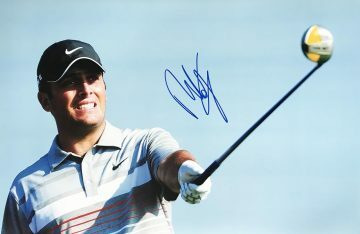 Shop now to discover our collection of Francesco Molinari signed memorabilia. We carefully source each item, supplied with 100% genuine guarantee. Choose from pieces to suit a variety of budgets – from signed Francesco Molinari gloves, balls, clubs and caps to mounted displays and signed photographs.